This great chart is recorded on the "Tonight Show Band, Volume II " CD(Amherst Records). This is a remarkable chart that features tenor saxophone throughout. This great chart is recorded on the "Tonight Show Band, Volume II " CD (Amherst Records). As recorded by the Tonight Show Band on "Once More With Feeling" (Amherst), John's arrangement (to quote Doc Severinsen), is a "masterpiece. 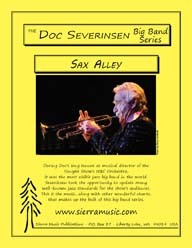 As recorded by Doc Severinsen and the Tonight Show Band on "Volume One"(Amherst), this is a red-hot feature for two tenor saxophones (recorded by Pete Christlieb and Ernie Watts).